Are you looking to keep your website updated for a reasonable investment? Keeping your website updated is critical to the success of your online strategy. Optimisation is the process of improving the HTML coding and page content of a website. It is designed to enhance the position of the listing in major search engines to ensure positive benefits for businesses, such as increased traffic through website and more customer enquiries. Having a valuable website is only part of the equation. In order for your website to be successful you need visitors to find your website. And those visitors must "convert" into your most desired action, whether that is a sale, a contact, a subscription, or whatever your goal for your visitors may be. That's where I can help you. Through my years of experience I have continually looked to find new and better ways to serve my customers needs.I proud to offer several flexible cost-effective options that I believe will fit your unique needs. 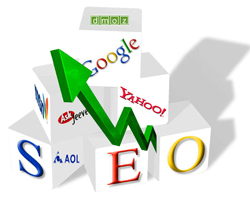 If you are serious about not only improving your search engine rankings, but also getting the most out of the visitors you do receive through search engines and pay per click advertising campaigns, then my comprehensive SEO Services are for you. My experience with websites and SEO has made us experts in getting the most out of your website. I take a unique approach. I treat each customer as a unique situation. I take the time to get to know your specific needs and create a website marketing strategy that is specifically tailored to your specific needs. I also results oriented, I create goals with measureable objectives and measure my actual success based upon these goals. The result is a comprehensive marketing campaigned designed specifically for your website to achieve the goals that are most important to you. Because my SEO service is flexible and based upon your needs, I can create a website marketing plan that will fit your budget. Contact me today and you'll see why I provide more individualized service and a greater value than other services that charge twice as much.